One of the primary goals in the search for exoplanets is to, hopefully, find an Earth analog or “Earth twin,” an alien world similar to our own. 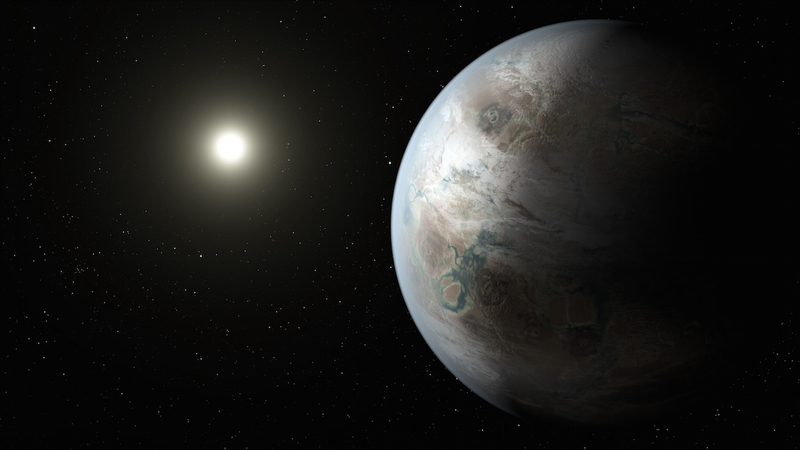 That search is still ongoing, but getting closer – yesterday NASA announced a new exoplanetary discovery that could be described as “Earth’s bigger and older cousin” – Kepler-452b. The new exoplanet is the smallest one so far found orbiting in the habitable zone of a Sun-like star (where liquid water could possibly exist). Kepler-452b is 60 percent larger in diameter than Earth and so is considered to be a super-Earth (planets which are larger than Earth but smaller than Neptune). Its mass and composition are not yet known, but the chances are good that it is a rocky world, like Earth. It is located 1,400 light-years away in the constellation Cygnus. The planet’s orbit is also similar to Earth’s, at 385 days, so a year there is only 5 percent longer than here, and is only about 5 percent farther from its star than Earth. The star itself, Kepler-452, is a G2 type star like our Sun, and estimated to be 6 billion years old, compared to 4.5 for our own Sun. It’s temperature is about the same as the Sun and is 20 percent brighter with a diameter 10 percent larger. As Jon Jenkins, Kepler data analysis lead at NASA’s Ames Research Center, explained, “We can think of Kepler-452b as an older, bigger cousin to Earth, providing an opportunity to understand and reflect upon Earth’s evolving environment. It’s awe-inspiring to consider that this planet has spent 6 billion years in the habitable zone of its star; longer than Earth. That’s substantial opportunity for life to arise, should all the necessary ingredients and conditions for life exist on this planet.” Jenkins also led the team who discovered Kepler-452b. In addition to Kepler, ground-based observations at the University of Texas at Austin’s McDonald Observatory, the Fred Lawrence Whipple Observatory on Mt. Hopkins, Arizona, and the W. M. Keck Observatory atop Mauna Kea in Hawaii were also used to help confirm the discovery. The new research paper has been accepted for publication in The Astronomical Journal and is now available online. The discovery is similar to the previous one in 2014 of exoplanet Kepler-186f, another near-Earth-sized world orbiting in the habitable zone of its star, except that the star, Kepler-186, is an M dwarf (red dwarf) about half the size and mass of the Sun. The Kepler-186 system is about 500 light-years away and also in the constellation Cygnus. Other smaller exoplanets (less than twice the size of Earth) have also previously been found by Kepler orbiting in their stars’ habitable zones, but those have all been M and K type stars. 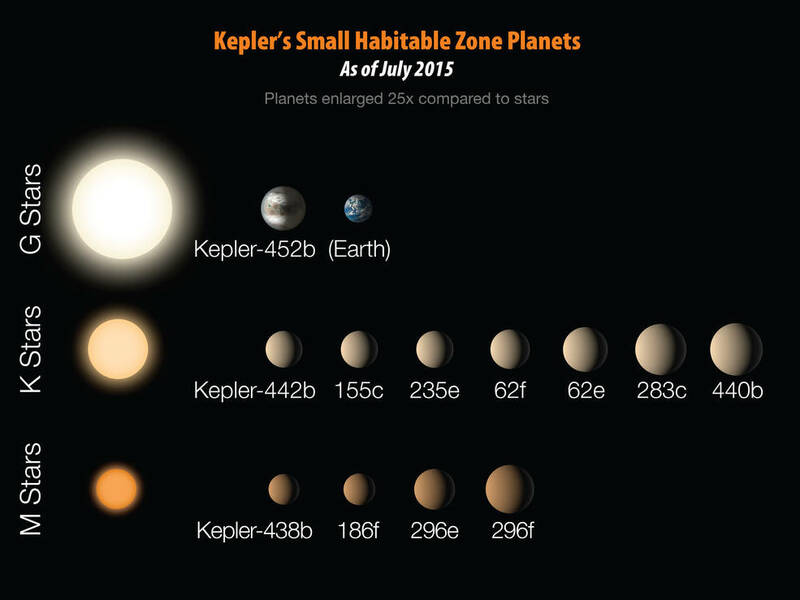 Kepler-452b is the first one found found orbiting in the habitable zone of a G type star similar to our Sun. 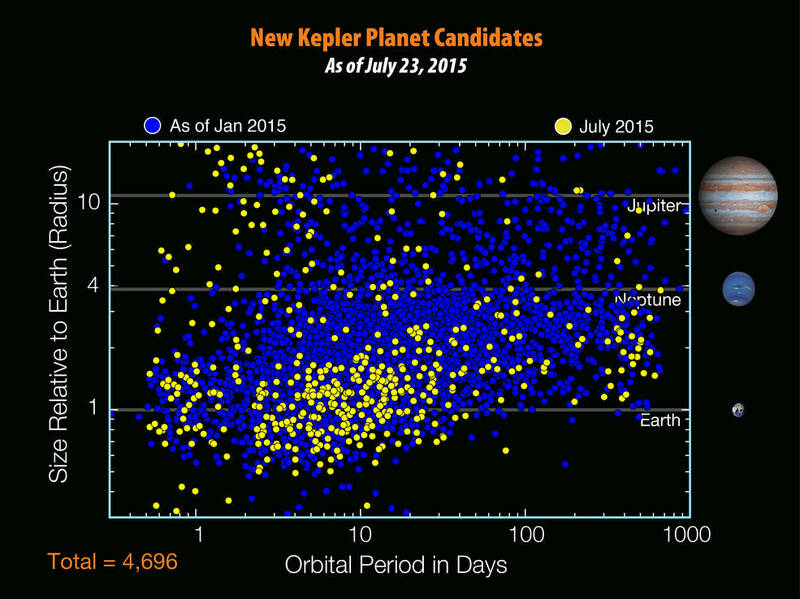 As well as Kepler-452b, the Kepler team also reported numerous other planetary candidates found, 521 new ones, bringing the total current number of candidates to 4,696. Twelve of the new candidates also orbit in their stars’ habitable zones, and have diameters one to two times that of Earth. Nine orbit stars which are also similar to our Sun in size and temperature. 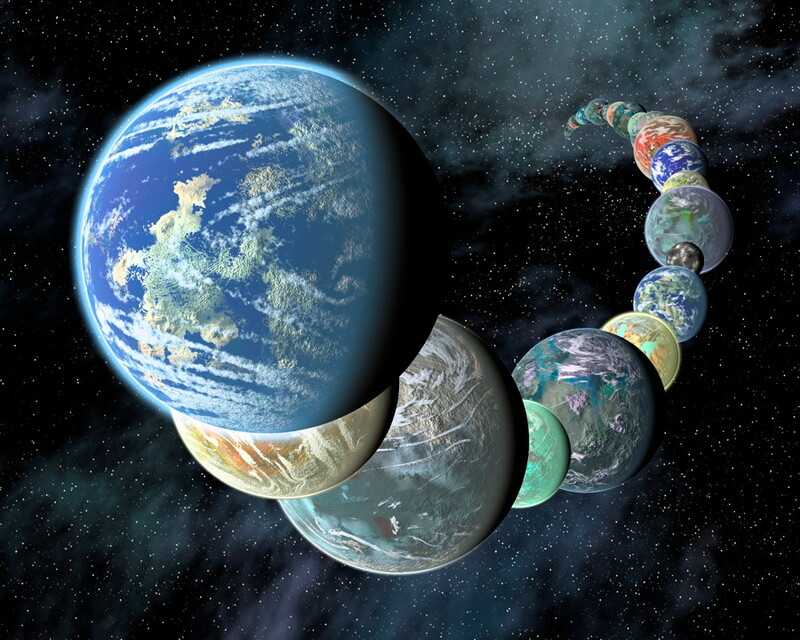 The new findings, presented in the seventh Kepler Candidate Catalog, will be submitted for publication in the Astrophysical Journal and are based on data in the NASA Exoplanet Archive. Kepler is now in its K2 extended mission phase and the last catalog based on the original findings from the primary four-year mission is now being produced. Other telescopes are also still finding new exoplanets as well, and according to the Open Exoplanet Catalogue, the current number of confirmed exoplanets now stands at 1,927. Kepler can only look at one very small patch of the sky; the number of exoplanets in our galaxy alone is now estimated to be in the billions, with the majority of those being smaller worlds like Kepler-452b or smaller, which bodes well for the search for evidence of life elsewhere. 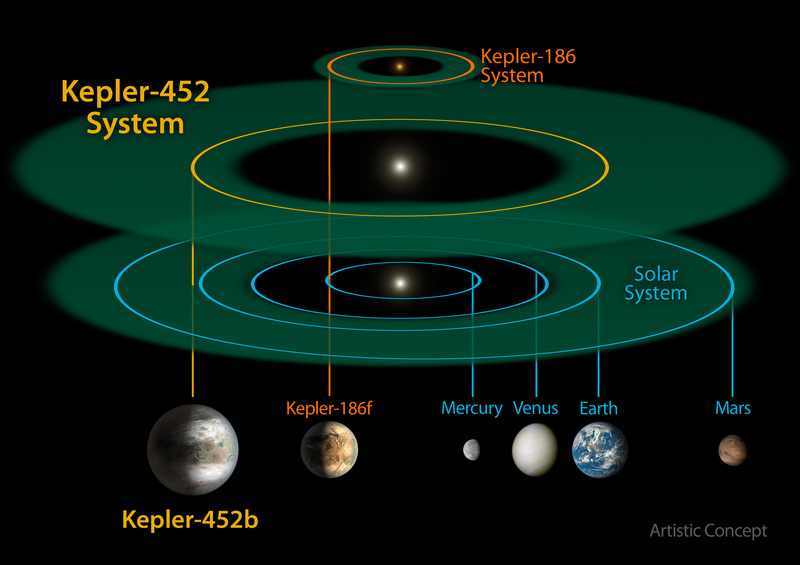 Kepler-452b might not quite be an “Earth twin” but it is another significant step closer to finding one. Briefing materials from today’s news teleconference are available here and more information about the Kepler mission is available here.